The Brazos River Authority has established ten public areas, scattered across much of the shoreline of Possum Kingdom Lake. These parks offer a variety of amenities, including boat ramps, public restrooms with showers, fire rings, cooking grills, and play areas for children ages 2 to 12. The Brazos River Authority does not take reservations for camp sites. Sites are available on a first come, first served basis. Day Users -- 10 p.m. The Brazos River Authority does not take reservations for camp sites. Sites are available on a first come, first served basis. However, Possum Kingdom’s parks offer plentiful camping spots. Campers are not required to check in with Authority officials when camping at free sites. Check-in centers are set up to collect fees at the entrance to those sites that charge during summer. Because of ongoing drought conditions, outdoor fires may not be allowed in all areas. Possum Kingdom Lake spans Palo Pinto, Young and Stephens counties. 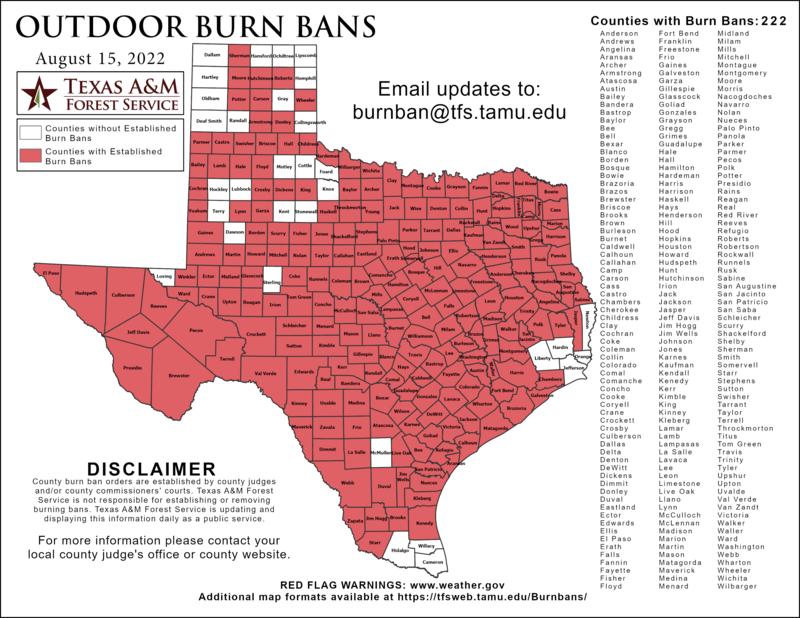 To see whether officials in those counties have enacted burn bans, go here: http://tfsfrp.tamu.edu/wildfires/decban.png. Anglers of all ages will enjoy visiting Possum Kingdom Lake. The upper reaches of the lake attract trout liners and bass fishermen. The mid-lake area sports many covers and sloughs that hold healthy populations of largemouth bass, both native and Florida strains. The lake has gained a reputation as an excellent striper and hybrid fishery. Stripers tend to haunt the more open and deeper parts of the lake close to the dam. Smallmouth bass will be found along the cliffs and among the rocks in the lower portion of the lake as well. The many marinas and boat docks around the perimeter of Possum Kingdom Lake attract crappie and other pan fish. The area just below the dam offers productive angling for bank fishermen. Access to the lake is convenient via any of seven public boat ramps and numerous public and private marinas. There are no boat ramp use fees. Each year, a drawing for Waterfowl Hunting Site Permits is held near the Labor Day holiday for the 26 on-lake approved hunting blind areas. Anyone wishing to obtain a Waterfowl Hunting Site Permit must be present at lake office to enter their name in the drawing. The permits are awarded through a lottery system and payment of the $200 fee must be made by check or money order the day of the event. If fewer entries are received than the number of available sites, the remaining sites are available on a first come/first serve basis by contacting the lake office at 940-779-2321. For hunting rules, click here.